Bourrée in E minor is a popular lute piece, the fifth movement from Suite in E minor for Lute, BWV 996 (BC L166) written by Johann Sebastian Bach. This piece is arguably one of the most famous pieces among guitarists. A bourrée was a type of dance that originated in France with quick duple meter and an upbeat. Though the bourrée was popular as a social dance and shown in theatrical ballets during the reign of Louis XIV of France, the Bourrée in E minor was not intended for dancing. Nonetheless, some of the elements of the dance are incorporated in the piece. Bach wrote his lute pieces in a traditional score rather than in lute tablature, and some believe that Bach played his lute pieces on the keyboard. If you like Bach’s music I can also recommend my version of “Jesu, Joy of Man’s Desiring” with a special tuning. Bourrée in E minor is a popular lute piece, the fifth movement from Suite in E minor for Lute, BWV 996 (BC L166) written by Johann Sebastian Bach. 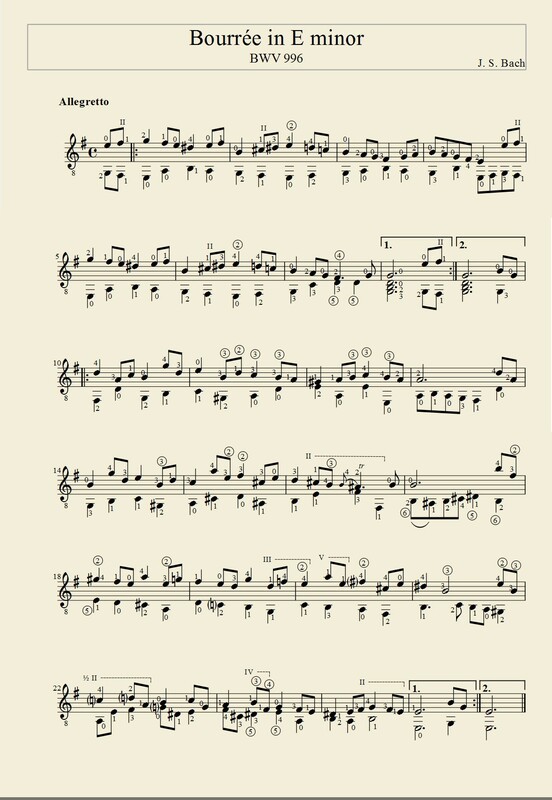 This piece is arguably one of the most famous pieces among guitarists.